I love taking pictures of the babies together. They are just so sweet. This is how they are bundled up when we walk across the street to pick up Jason from school. 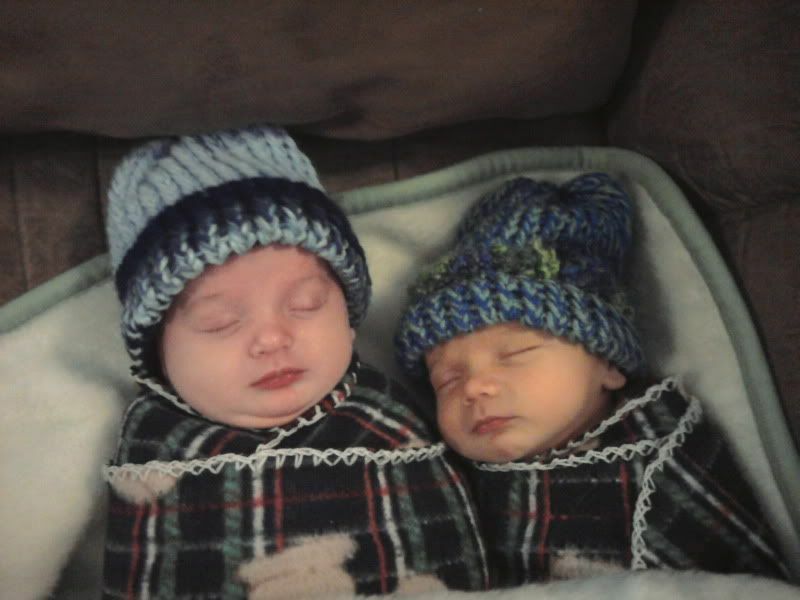 I put a nice warm blanket in the reclined back seat of the stroller, wrap up the babies and put warm hats on them (my mom's good friend made them), and put them in the seat with the warm blanket tucked around them, then another blanket over the top to block the cold and wind. They usually sleep the whole time and often stay asleep when I bring them in after we get home. They look so cute snuggled up to each other! Awww!! They look so cute with their little hats on! I can't wait to see them! I'm a mom of the 5 cutest boys in the universe. Despite the sleepless nights, terrible 2's, and endless dirty diapers, I wouldn't give it up for anything!